When Guardians of the Galaxy was first announced to be part of Marvel’s “Phase 2” line of films, people thought the idea was so ridiculous and dumb – after all, how could anyone take a gun-toting racoon and giant tree seriously after the likes of Iron Man and Captain America? – it was destined to fail. Instead, it went on to become one of the most beloved entries in the ongoing Marvel Cinematic Universe, with fans to this day positioning said raccoon and tree on the same list of popular characters as, yes, Iron Man and Captain America. It also made the inevitable sequel an instant must-see amongst general audiences, especially with writer-director James Gunn back in the saddle along with the main ensemble that became the comic equivalent of rock stars following its debut. Now that it’s here, however, is Guardians of the Galaxy Vol. 2 worth the wait, or is it exactly the kind of bomb that most were expecting the first one to be? Thankfully, it’s very much the former, albeit with a couple of reservations because I am not entirely convinced that this movie is legally sane (which isn’t as bad as you may think). 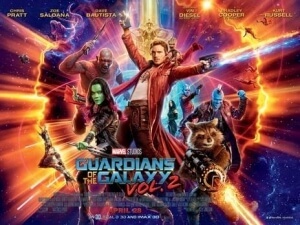 This one picks up only a short while after the events of the first film, with the titular team – comprised of half-human scavenger Peter Quill aka Star-Lord (Chris Pratt), green-skinned assassin Gamora (Zoe Saldana), skilled warrior Drax (Dave Bautista), tech genius and permanent sourpuss Rocket Raccoon (Bradley Cooper), and a tiny and instantly lovable version of tree monster Groot (Vin Diesel) – going about their business, protecting the galaxy and slaughtering monsters for a price. When they find themselves on the bad side of a gold-skinned race known as the Sovereign, the Guardians are soon saved by a mysterious being who calls himself Ego (Kurt Russell) – and also happens to be Peter’s biological father. From there, it’s a concoction of space-set mayhem, from the return of former enemies and allies like blue-skinned thug Yondu (Michael Rooker) and Gamora’s half-cyborg sister Nebula (Karen Gillan), to the most bonkers of visual asthetics and moments of quirky humour, all set to the glorious playlist of Awesome Mix Vol. 2 which features tracks by ELO, Fleetwood Mac, Looking Glass and many other 70s/80s classics. Those expecting something bigger in every possible aspect than the first one will certainly not be disappointed; everything from the action to the effects to the humour and beyond is jacked up to eleven this time round, creating a surreal portrait of sheer intergalactic madness that’s hard to look away from or not be entertained by. Gunn’s trademark oddball humour is well intact, which is clear from an opening credits dance sequence that’s happening right in the middle of an epic battle, and never lets up with just how bonkers and consistently funny it is. Bautista’s Drax gets the lion’s share of laughs, mainly from his unfiltered declarations of truth as well as his own expressions of pure joy, but everyone gets a moment or two to shine whether it’s in the comedy or action departments, and sometimes even in the more dramatic parts of the movie (and in case you’re wondering, yes, Baby Groot is goddamn adorable, as is Pom Klementieff’s new addition to the roster, the empathy-powered Mantis). The action, too, feels much grander in scale this time, with certain set pieces that deserve an IMAX viewing to just get half the scope of them, and they remain fun and extremely entertaining exercises in how to do a large-scale comic-book action scene without losing any of the focus. Plot is second-nature to this film, as when you really break it down there’s not a whole lot of structure to it, with hardly any of it setting up future instalments in the MCU, aside from the odd mention of Infinity Stones and Avengers baddie-to-be Thanos, or even giving hints as to where these characters are going to go next. However, part of the charm of this movie is that it’s its own thing, a self-contained movie that doesn’t really care about setting things up for the future, and just wants to explore just how deep it can go with its own unhinged behaviour. It’s an insane ride of a movie, but luckily it’s the kind of ride where you’re screaming with joy all the way through, and feel somewhat disappointed when the ride eventually comes to an end (although there are parts where it feels a little too stretched out to get it past the two-hour mark). Like any exhilarating rollercoaster, it’s best enjoyed right there in the moment, and even when you think back on it afterwards you’re filled with such pleasant memories of it you instantly want to ride it again. As obvious as it may seem to say let alone think, a film that features a talking raccoon with a machine gun and a deadly little tree really doesn’t require a lot of thought. If you’re eager to just go in and enjoy yourselves, much like how everyone experienced the first one, then you will get everything you have paid for; it’s a delightfully bonkers and grandiose summer blockbuster that sets the bar high for any future cosmic MCU entry, namely Thor: Ragnarok later this year (although going by the trailer for that one, as well as Spider-Man: Homecoming, we could be in for a very prosperous year for Marvel…). Guardians of the Galaxy Vol. 2 amps up the intergalactic insanity of the first film all the way to eleven, with everything from the action to the humour feeling much larger and on a grander scale than before, making it feel like an exhilarating and endlessly loopy rollercoaster ride you’re more than willing to ride more than once, and pinpointing the start of a hopefully just-as-fun era for the Marvel Cinematic Universe.